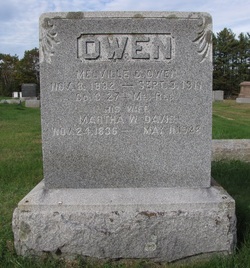 MELVILLE B COX OWEN, the son of John and Ruth (Hill) Owen, was born in Buxton, Maine on 8 Nov 1832 [Buxton VR; grave]. He died on 3 Sep 1911 in Buxton at age 78 yrs, 9 mos, 25 das [ME Death Rec] and is buried in the town's Highland Cemetery [YCCI, p391-2]. He was married (intents published 5 Sep 1856) to MARTHA W DAVIS, the daughter of Simon and Jane (McClellan) Davis. She was born in Standish, Maine on 24 Nov 1836 and died in Standish on 14 May 1922 [ME Death Rec; grave says 11 May]. She is buried with her husband in Highland Cemetery. Melville was one of three sons of John and Ruth Owen who joined the 27th Maine Infantry in September 1862. Like brothers Elijah and Mark, he was also a farmer as was their father. Melville also served as a town clerk for Buxton, 1892-93.